The First Amendment of the United States Constitution guarantees that Congress shall pass no law respecting an establishment of religion or the free exercise thereof; or prohibiting the right to freedom of speech and expression or of the press, freedom to assemble and to petition the Government for a redress of grievances. 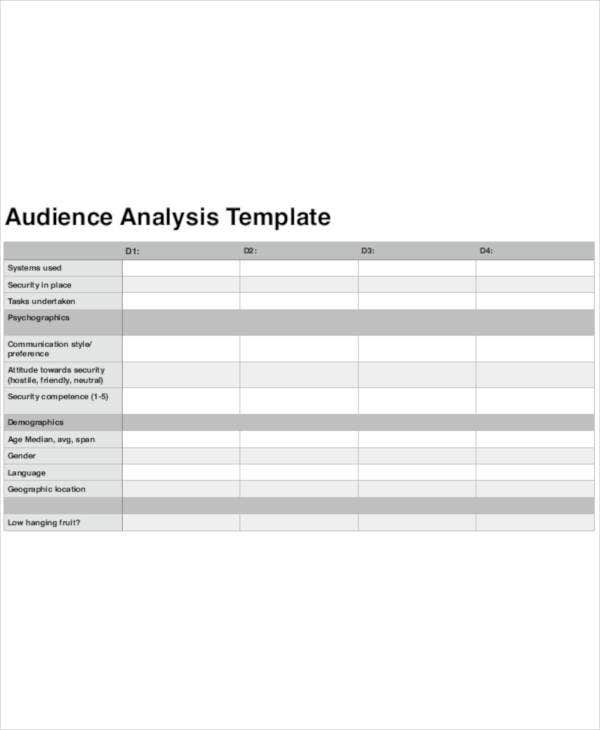 You can also like company analysis report templates. Such democracy has consequences and our right to free speech have never divided this country so much then it currently does. Because we give too much focus in being able to exercise our right to free speech and say what we want to say, we often overlook the person or people at the receiving end of our words and what they mean, or what we think they mean. You may also see behavior analysis templates. We forget to question who our audience is and as a result, our message loses its value because they may not even care about what we think. They may not be as passionate about the subject we’re discussing as we are. They may actually be thinking here you are wasting your time, contributing nothing to their train of thought since what you’re saying does not concern them in any way whatsoever. You may also like customer analysis templates. Have you ever spoken before an audience? If you haven’t been put on a podium or talked in front of a crowd but have created something visual or written, you can still consider that as speaking, although you wouldn’t call it speaking per se. Be it in oral, written or visual form, if you’re delivering a message to an audience, you’re speaking to them, in more ways than one. In the case of business marketing and communications efforts, the success of the message in the campaign just like a speech largely depends on how the audience receives and understands it. You cannot expect to have the same level of interaction with an audience as that of what you have with another person in a normal conversation since there is usually limited communication that happens between an audience and a speaker which means there is also little to no chance for you to go back and explain what you mean either while you’re still speaking or when you have finished. 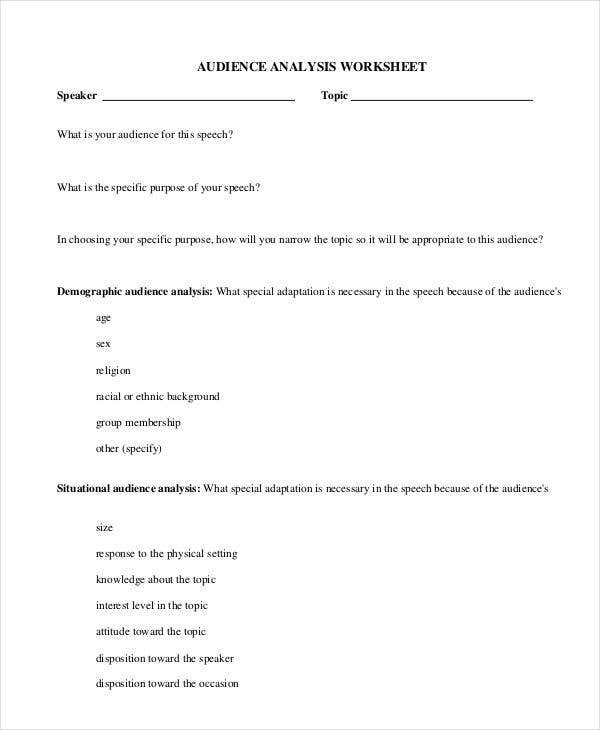 You’d have to prepare a speech which is audience-centered, a speech focusing on your audience and this is what an audience analysis would be able to provide in a more organized way. 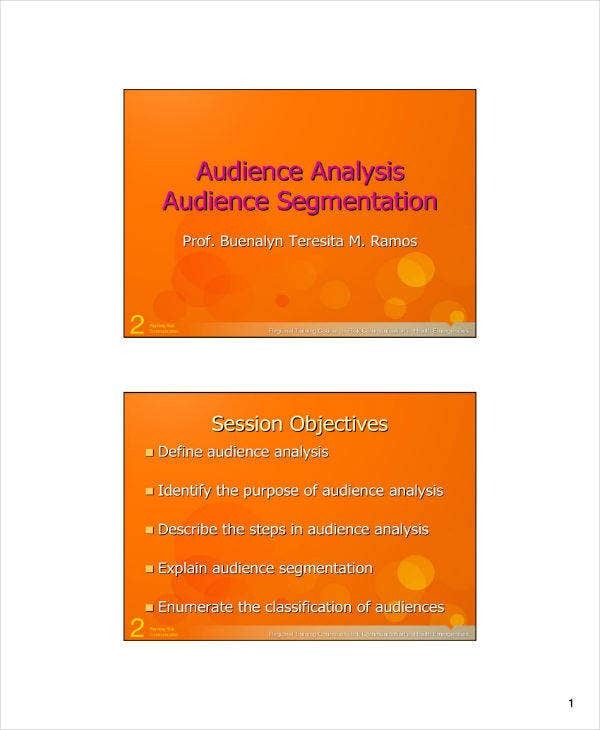 You can also read market segmentation analysis templates. 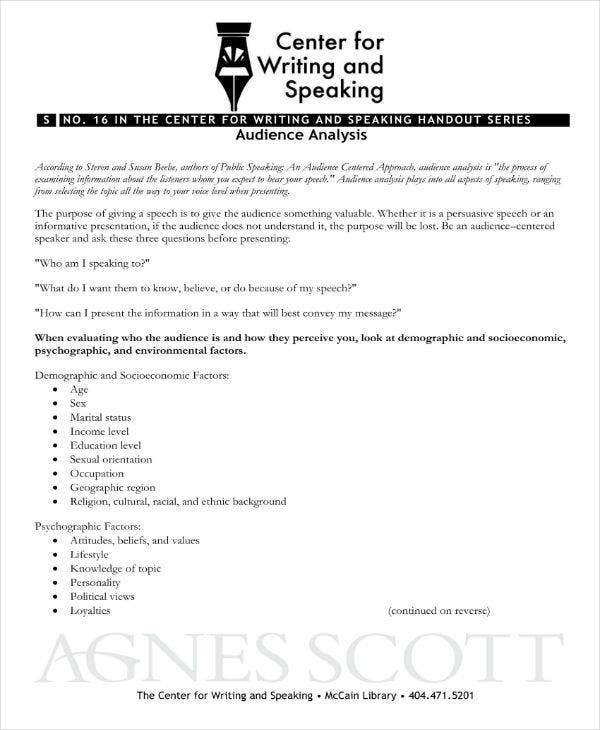 Public speaking requires you to speak to and for your audience, therefore understanding your audience is a big part of your speech-writing or making process. In speeches that are audience-centered, in which case, most speeches are, knowing your audience is a task that you can neither miss nor point blank refuse to do. You’d want to determine major demographics; age, gender, sexual orientation, education, religion culture, including groups the audience are members of. In addition to this, you may want to learn their values, beliefs, and attitudes so that you can plan your message based on what you find out about them. You may also like sample customer analysis templates. 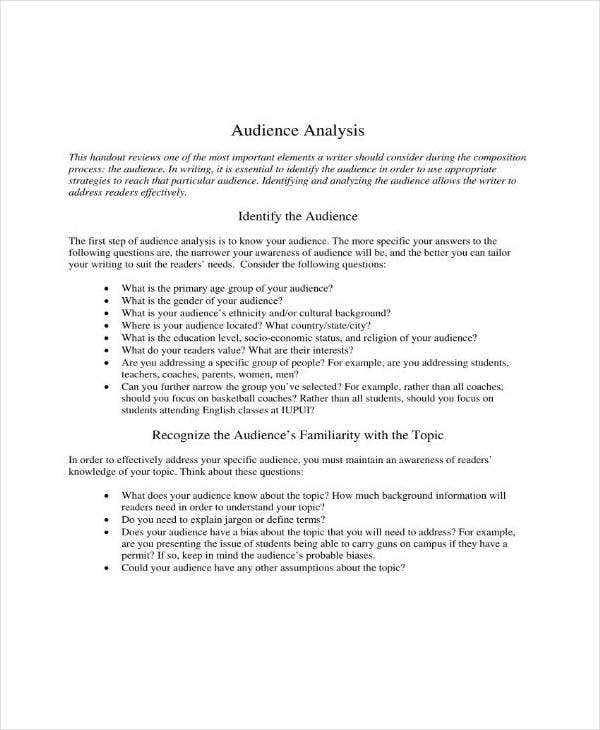 Audience analysis deals with identifying an audience and creating a speech or a message according to their interests, level of understanding and beliefs. A communication principle has it, that meanings are in people, not in words. It means exercising empathy. Put yourself in the audience’s shoes. For an audience to get the message, you have to put yourself in their situation and most of the time, this also means meeting them halfway, finding a common ground or even going down to their level of understanding. You can also like research analysis samples. For you to do so, you’d have to do enough research about your audience and find out who they are. Putting a speech’s focus on an audience is very important because it’s one of the most effective ways a speaker can improve his skill, especially if the message is created, presented and delivered in an appropriate fashion. Doing an extensive research to identify an audience is oftentimes difficult so audience adaptation of a speech often calls for a healthy use of imagination. You can also like SWOT analysis templates. 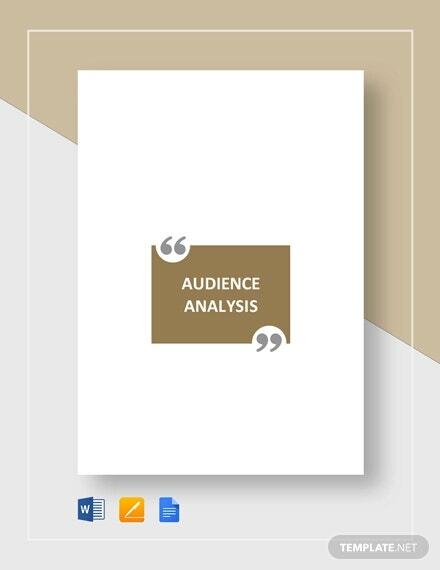 Like many valuable tools and strategies in communication, audience analysis can be used to its full extent. However, analyzing an audience in adapting a message for an audience and simply telling an audience what they want to hear, are two very different things. 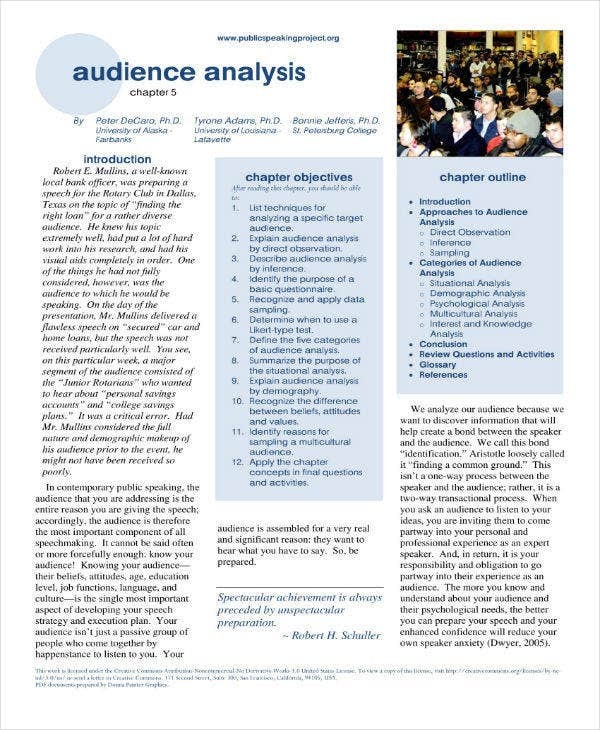 Audience analysis isn’t “grandstanding,” to or spoon feeding a public but rather a guide towards the stylistic use of content that a speaker makes for a good presentation or speech. It often involves crossing the fine line between over adaptation and under adaptation which is a necessary distinction that can be appreciated more through a deeper understanding of the general idea behind such a skill. You can also like financial analysis samples. An audience’s knowledge and understanding of a certain topic can differ in any given situation. It is therefore important for communication practitioners to determine what their audience know about the topic that would be discussed. You should also avoid expecting too much of an audience’s knowledge of a subject. You can also like product analysis reports. For instance, if you transition to a technical and jargon-filled discussion of genetic modification among animals but the ones listening to you aren’t even familiar with basic genetic terms, they will not be able to follow through your speech, and would easily lose interest, thinking you’re wasting valuable time. Meanwhile, underestimating an audience’s knowledge may end up in a speech that’s terribly condescending and borderline disrespectful. You may also see process analysis templates. Audience members are usually egocentric. They’re only interested in issues or a topic that concerns or directly affects them or their community. As the speaker, your analysis of the audience should help you show them why your message is worth listening to, and why it is important to them. You can also like trend analysis templates. No group of people would ever have exactly the same views about any topic. There would always be a mix of how an audience feels regarding something. There would be some who would feel strongly opposed, others who are undecided, with the rest agreeing to your claim and still others who would be simply apathetic. You can also like gap analysis templates. A common communication approach to this would be not to give too much focus on those who already agree with you and those who are vehemently opposing will most likely not be convinced by one speech, no matter how compelling it turns out to be. Your target audience should then be made up of people from the two extremes—these are the people you should prioritize in your analysis. Writing your speech with them in mind would give you a better chance at creating a bigger impact with your message. You can also like analysis templates. While audience analysis requires considering basic demographics as its very important factors, such analysis does not warrant stereotyping. Stereotypes defined are a widely held but fixed and oversimplified image or an idea of a particular type of person or people in a particular group. Stereotyping bluntly ignores individual differences and therefore causes even the most educated people to make decisions based on faulty reasoning. 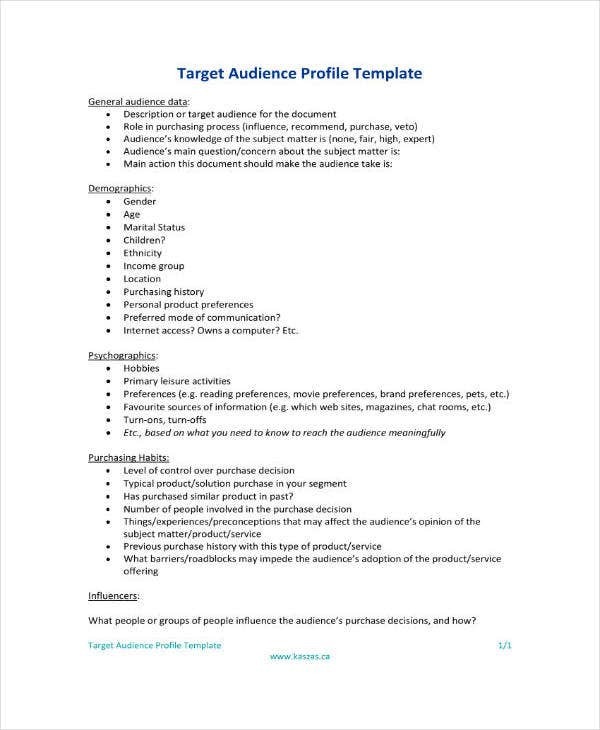 Learning everything that you can learn about your audience using the strategies previously mentioned in this article is the best way to avoid the pitfalls of stereotyping, instead of just basing your decisions on preconceived notions about a particular group. 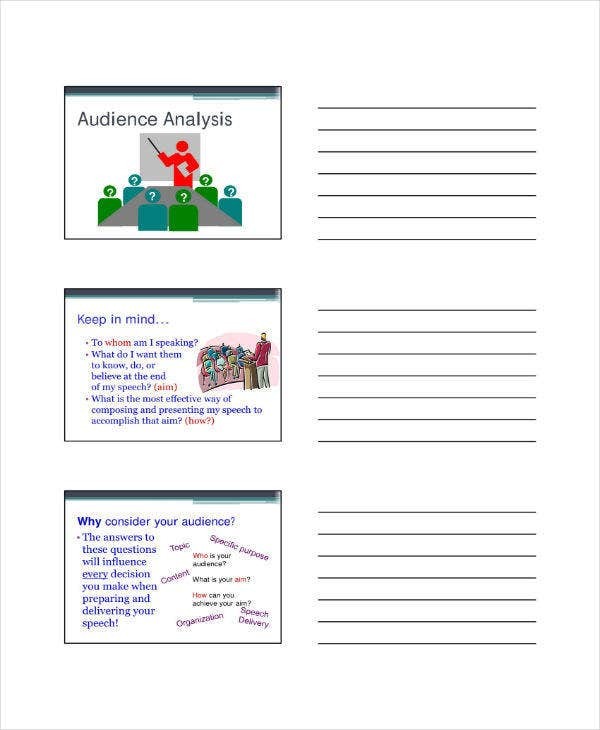 You may also check out sample organizational analysis templates. Flattery is so tricky yet so easy to use, there’s just no avoiding it sometimes, and that’s the problem with rhetoric. It’s also the most common and probably the oldest criticism about it, especially when it comes to persuasive speech-that it’s nothing but nonsensical, mere flattery, where the speaker is ever so patronizing he forgets to make a point. You can also check out the printable project analysis templates. But you cannot get away using flattery with an educated audience, however much you see politicians do it over and over and over again during campaigns and honorary speeches, changing their stance on a particular issue to please different groups of people. To prevent committing the same error, make sure to have the goal of first and foremost informing and educating the audience about the topic you’re discussing. This is also where you get to have valuable use of audience analysis. It would help you discover the best way to reach that goal. You can also check out data analysis templates. You don’t have to have a microphone to talk to a group of people. You just have to have a message. And if you’re concerned about the message, as you should, then you have to have an approach focusing on the receiver of your message which is your audience. When it comes to public speaking, the speaker needs to be prepared to create a relationship with his or her listeners, in order to get the speech a fair hearing. You may also see situation analysis templates.